By adding promotional product distribution and a new HP Indigo 10000, Printing and Distribution Solutions at the University of North Texas has cut costs and added value. Press Operator Earl Callahan (left) and Production Manager Mark Spicer check a sheet printed on the in-plant’s five-color Ryobi 755 offset press. If your in-plant had won 100 In-Print awards since 1988 — 86 of which were in the past 10 years — you might think you would have nothing to worry about. And yet, Lora Connaughton, director of Printing and Distribution Solutions at the University of North Texas (UNT), explains that every in-plant is worried about its future sometimes. The key, she says, is to stay relevant and ensure that you are able to provide the organization with what it needs. Standing with UNT’s new HP Indigo 10000 are (from left) Clem Deussen, assistant director, Eagle Images; Lora Connaughton, director; Roy Nance, associate director; and Bernie Emmons, director of promotional sales. And Connaughton means anything. Printing and Distribution Solutions provides printing, mailing, fulfillment and promotional products for UNT. The 45-employee in-plant once even acquired custom-made stuffed squirrels and eagles for the university when it needed them, she says. To be able to provide a large university with anything that it needs is no easy task. The Denton, Texas-based in-plant serves one of the largest schools in the state, with an enrollment of more than 38,000 students. 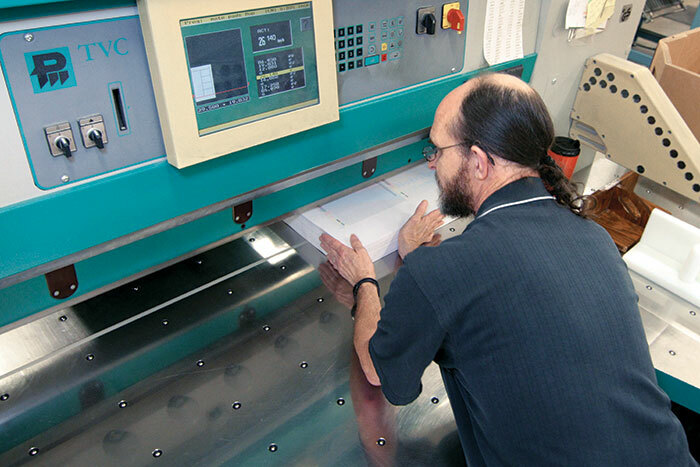 To meet its daily demands it has a fleet of digital, offset and wide-format presses, as well as a slew of binding, finishing and dye-sub equipment in its 30,000 sq. ft. of space, which includes the Eagle Images retail operation in the student union. With a $4.8 million budget and a revenue increase of 26% during the past three years, the in-plant is growing. 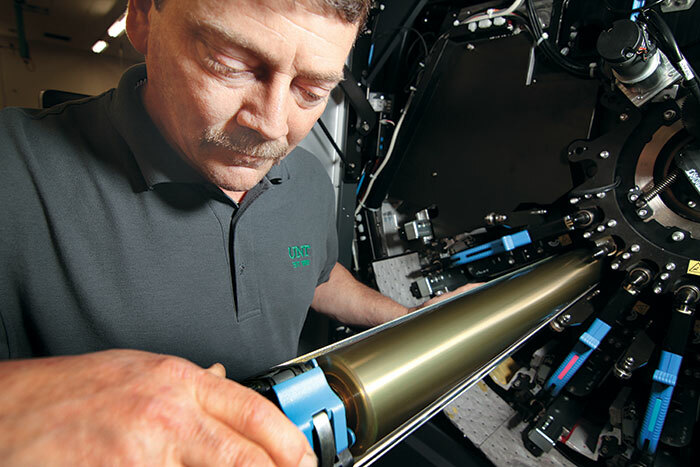 Mark Spicer checks a roller on the HP Indigo 10000. Even a change in management hasn’t slowed down Printing and Distribution Solutions one bit. Although longtime Director Jimmy Friend retired in 2012, Connaughton has kept the train running along the track that he built. 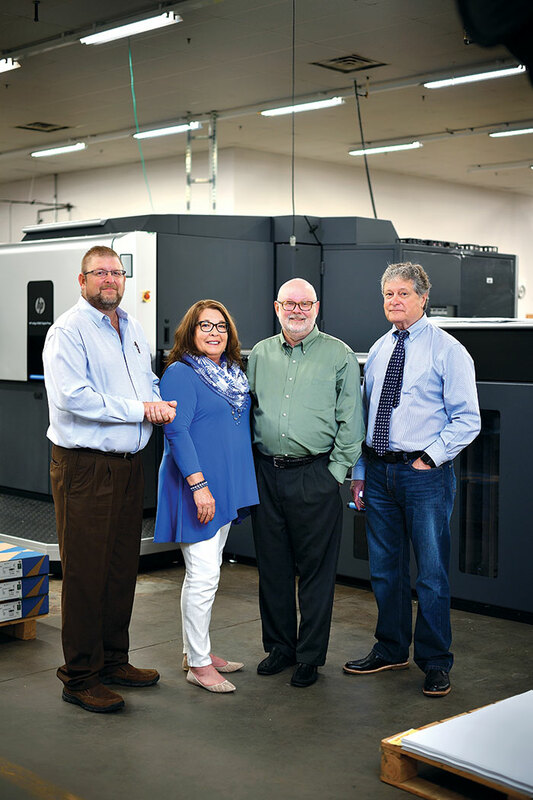 When Friend added the in-plant’s first digital press in 2002, an HP Indigo 3050, he started a trend toward digital that has continued today. Since then, the in-plant has added a few other digital presses, with its most recent addition being an HP Indigo 10000 in March 2017. Although Printing and Distribution Solutions has always been home to offset presses, the HP Indigo 10000 is just one more signal that the in-plant is investing in the digital revolution. Connaughton says that it was a matter of looking at the work that was coming in versus the amount of work that had to be outsourced because the offset presses were booked or the job was too large for the in-plant’s other digital presses. Since the in-plant’s largest customer is the university’s Admissions department, Printing and Distribution Solutions has to frequently provide personalized marketing pieces for Admissions and Recruitment. One of these jobs in particular, Connaughton explains, is to provide large quantities of postcards with variable data, sometimes at quantities around 50,000. In the past, a job like this would not have been cost effective to run on digital equipment. Now, the Indigo 10000 can run the 50,000 personalized postcards quickly and efficiently. With its sheet size and high quality output, Connaughton says that it can run “pretty much 90% of what ran on the offset press,” which is encouraging considering the Indigo 10000 was installed as a backup for the in-plant’s offset equipment. 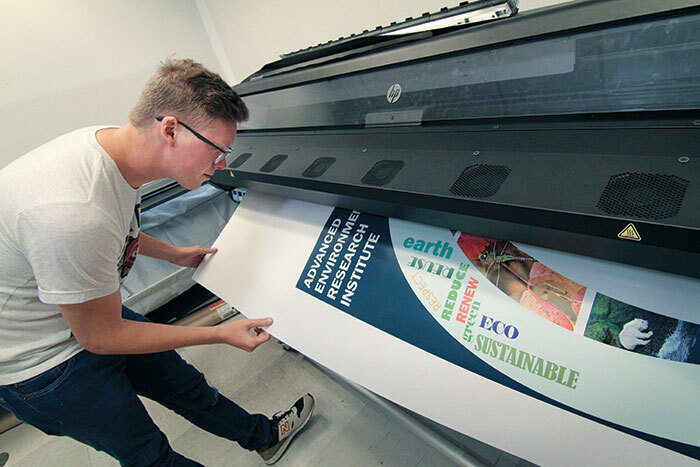 Eagle Images student assistant Wilson Haynes inspects a poster being printed on the HP 360 latex printer. Although it’s only been up and running for a couple of months, it has taken on the variable data postcard work and will run 16-pg. self-cover booklets, 8½x11˝ standard booklets, tri-fold brochures, and 18x24˝ posters that are too large for the other digital presses. Likewise, poster orders that are too high-quantity to efficiently run on the wide-format presses can be produced on the HP Indigo 10000. Not only is efficiency a factor in running these types of jobs on the new digital press, she says, the quality is nearly that of offset. “The quality is so close to offset, unless you’re a printer, you’re not going to know,” she contends. Even though the quality, speed and variable data capabilities of the Indigo 10000 have proven their worth, Connaughton says there was a big learning curve for operators. 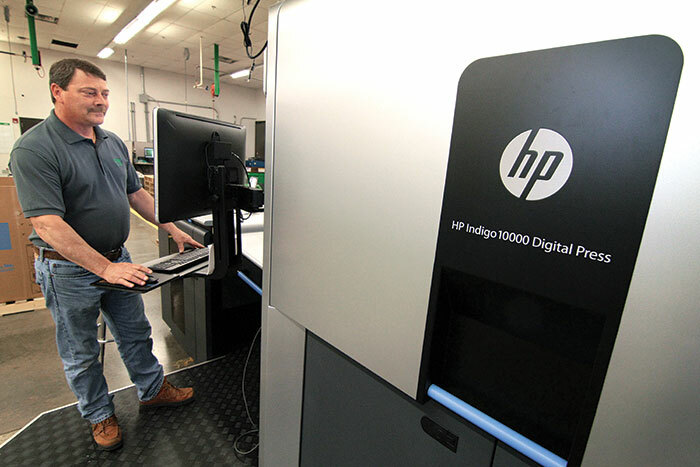 Although the in-plant has run Indigo presses for years, the Indigo 10000 and its software is different from previous versions, prompting Connaughton to send two operators to HP’s Atlanta facility for two weeks of training. Jeff Samson checks a booklet being run on the C.P. Bourg bookletmaker. With its substantial move toward digital, it might be reasonable to believe that offset isn’t long for UNT Printing and Distribution Solutions, but Connaughton explains that offset still has its place at the in-plant. For large quantities of certain items offset is simply more cost effective, she insists. The in-plant has a busy wide-format printing business, and latex jobs in particular are very popular, Connaughton says. The shop uses a 64˝ HP 360 Latex wide-format printer and a 60˝ Epson Stylus Pro 11880. In 2015, Printing and Distribution Solutions won the In-plant Printing and Mailing Association’s In-House Promotional Excellence Award, and it’s easy to understand why. In addition to the typical means of promotion an in-plant might employ — sales calls, on-campus flyers and posters, email blasts, vendor fair tables, open houses — the in-plant does something unique, it makes donations. Operator Amber Guillory performs maintenance on the HP Indigo 10000. Connaughton says that to get its services in the spotlight, she looks for events that will be heavily attended and then makes a donation on behalf of the in-plant with a message such as “Compliments of Printing Services.” She says that the in-plant has also donated its services by printing free programs for university conferences, as well as for the HR service award event, which garners high attendance. The in-plant also uses its many In-Print awards — including its three Best of Show awards — to promote itself. They show that UNT Printing and Distribution Solutions is a high-quality, professional operation, on par with any commercial printer. Randy Groves runs one of the in-plant’s Perfecta cutters. One example in particular that sticks out to Connaughton is a gala invitation ordered by the university president’s office. The invitation won an In-Print Gold award, so Connaughton made a duplicate of the award, and it is now hanging in the president’s office. But that’s not the only award hanging throughout the campus. Any time the in-plant wins an award, a duplicate is made and presented to the customer that ordered it. The awards work as an organic means of promotion; as people see them they are intrigued and impressed by the work that Printing and Distribution Solutions provides. In the past 10 years, Printing and Distribution Solutions has kicked it into overdrive, winning 86 In-Print awards from 2007-2016. Much of this, Connaughton explains, is due to its vast improvement in technology. 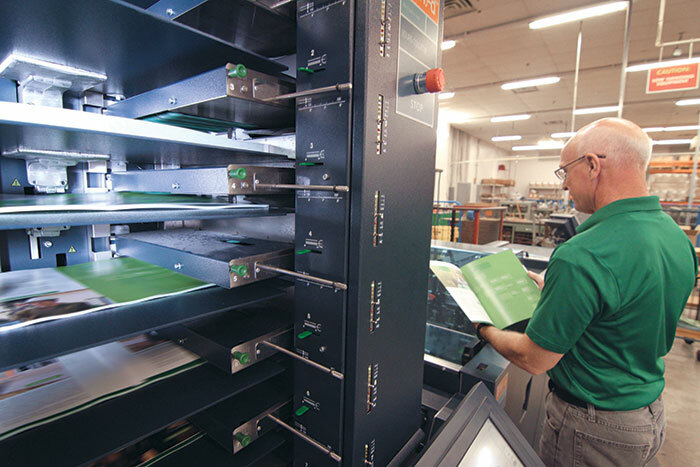 In addition to the digital presses added over the years, the in-plant installed a five-color offset press in 2010 — a significant upgrade over its previous two-color offset press. But what really sets Printing and Distribution Solutions apart, Connaughton concludes, is the dedication of its staff and their willingness to adapt to the new services and technologies the in-plant is adding to bring more value to UNT. One of the biggest changes that Lora Connaughton has spearheaded since the retirement of former Director Jimmy Friend has been the addition of promotional products, which now account for 21% of UNT Printing and Distribution Services’ work. In 2014, Connaughton explains that Printing and Distribution Services decided to become a distributor of promotional products for the university. What started as foreign territory for the in-plant has blossomed into a major cash cow. Although the in-plant does have dye-sublimation capabilities, these are only useful for small orders. Printing and Distribution Services became a distributor to be able to provide the university with any type of product it could possibly need. From pens and clothing to cups and luggage tags, Connaughton says the shop now offers close to one million different items in its catalog. Promotional products can be customized and ordered online through the catalog, including stationery, letterheads and business cards. If a department needs unusual items, such as stuffed animals, Connaughton says that the in-plant will purchase the items and send them to be customized. There are some drawbacks to being the middleman between vendor and customer, Connaughton admits, because you’re at the mercy of the vendor’s product quality, putting you at risk. It also takes time to research what customers will order and to do estimates. All in all, though, she says she would recommend that other in-plants consider adding promotional product distribution capabilities to increase revenue and value. It also accounts for big savings for the university. Connaughton says that handling promotional products in-house saved UNT approximately $400,000 in 2016, compared to the cost of using outside vendors. Looking at the bigger picture, she says Printing and Distribution Services saved the university close to $1 million over the course of the year by not outsourcing printing, mailing and promotional products.